Browns Bay Lodge was founded by forty seven dedicated Freemasons and it was the aim of the Founders to provide a permanent ‘home’ of our own in the Bays. The Constitution and Dedication of Browns Bay No 346 took place on Thursday 2 June 1949 in the Masonic Hall, Hurstmere Road, Takapuna. It will be remembered that in the early days the Lodge met in the Takapuna Lodge Rooms and in the R.S.A. Hall, Browns Bay until the Browns Bay Masonic Centre was built in Anzac Road. The first regular meeting was held in the Centre on 12 December 1956. In November 1971 representatives of Browns Bay and Rangitoto Lodges and Tiromoana RAC No 105 met to draw up the ‘Conditions of Joint Ownership’. The outcome of this was that the amalgamation did take place and since that date improvements to the building and facilities progressed rapidly. The first fifty years came and passed quickly our history shows that the Lodge was still strong in numbers with 84 members, being amongst the larger Lodges in the Auckland District. In 1998 a proposal was put to members of Browns Bay Lodge to support a new Masonic Centre on the North Shore. During the next decade of the 1990’s lodges on the Shore explored many concepts. In February 2003, the building at Browns Bay Masonic Centre was put up for Auction and sold. 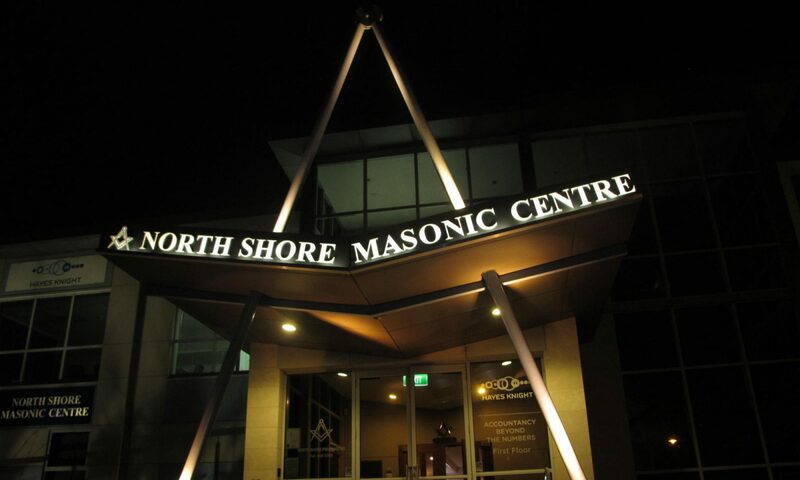 On the 16th April 2005 the dedication of the Combined North Shore Masonic Centre at Albany took place. We now all have a building that present and future generations of Freemasons can be proud of. On the 17th June 2009 Browns Bay Lodge No 346 Celebrated 60 years of Freemasonry and we look forward to the future of Browns Bay Lodge No 346 in our new environment.